An emanation of Buddha Amithaba, The 14th Kunzig Shamar Rinpoche is second to Gyalwa Karmapa in the spiritual hierarchy of the Karma Kagyu School of Tibetan Buddhism. The first Shamar Rinpoche, Khedrup Trakpe Senge (1283-1349), was the principal disciple of the 3rd Karmapa, Rangjung Dorje. His second incarnation, Kacho Wangpo, received the Red Crown from the 4th Karmapa, Rolpe Dorje, an exact replica of his own Black Crown. 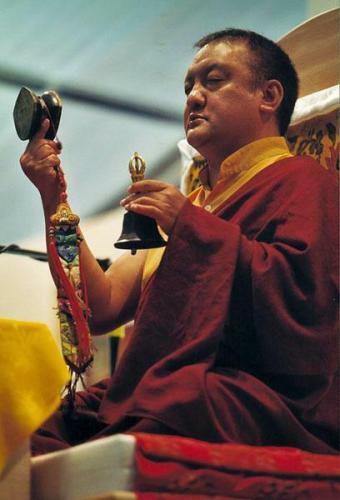 With the Red Crown, the Karmapa bestowed on him the name of “The Shamarpa – The One with the Red Crown.” Since then, Karma Kagyu texts speak of two Karmapas, the black hat and red hat Karmapas, always alternating as teacher and student throughout centuries. The 14th Kunzig Shamar Rinpoche Mipam Chokyi Lodro was born in 1952 in Derge, Tibet as the nephew of H.H. the 16th Karmapa. He was recognized as the new Shamarpa incarnation at the age of six, and was taken to Yang Chen Monastery, the main seat of the Shamarpas in Tibet. He left Tibet at the age of 9 together with H.H. the 16th Karmapa for Sikkim, India where he lived and studied under Karmapa’s guidance. Shamar Rinpoche has received the entire teachings and transmissions of the Karma Kagyu School from H.H. the 16th Karmapa at Rumtek monastery in Sikkim. After Karmapa’s death, Shamar Rinpoche undertook the project of completing the Karmapa International Buddhist Institute (KIBI) in New Delhi, India. In March 1994, he officially recognized Trinlay Thaye Dorje as the 17th Gyalwa Karmapa. Shamar Rinpoche spends most of his time giving Dharma teachings around the world.